It’s January……. In Maine…….. 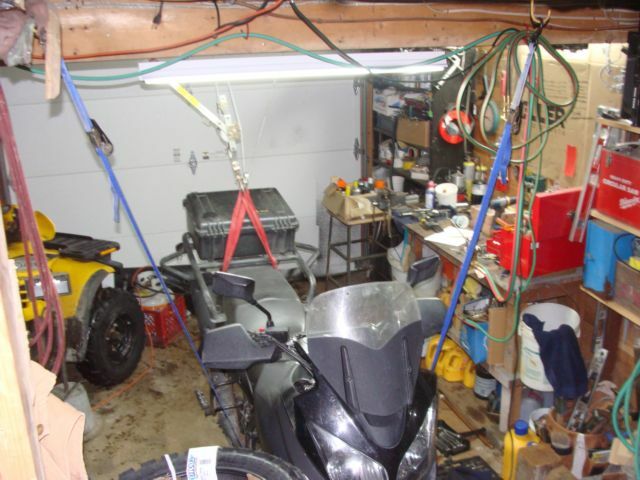 I am in the process of replacing my cushion lever and swingarm bearings on my 2007 DL-650. 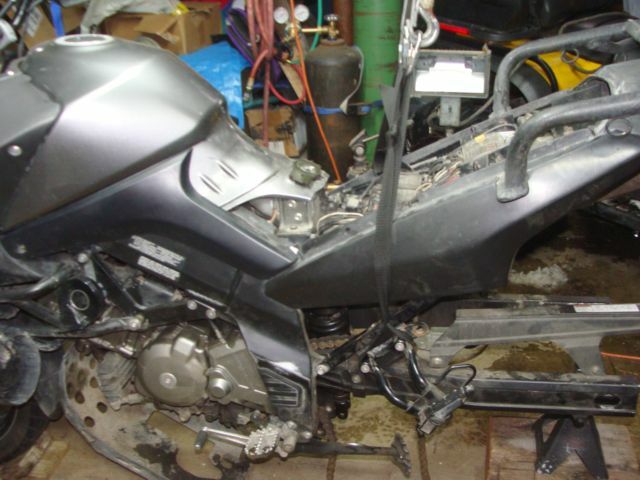 I have 62,885 miles on the bike and I have never done any maintenance in this area. I decided not to order my bearings ahead of time before I started this job. 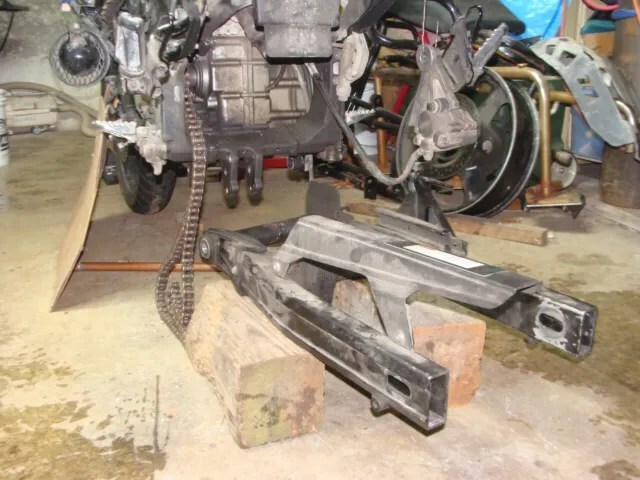 I wanted to fully disassemble the back end of the bike before I placed an order for parts to make sure my list was complete for the parts that I needed. 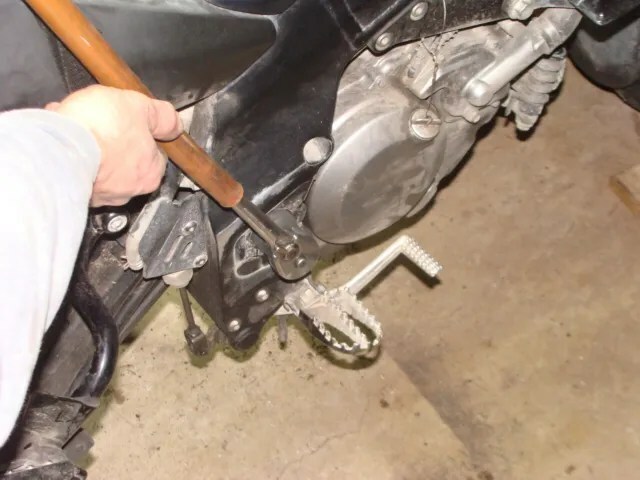 There are two “special” tools that are needed, (to purchase, or to make), to remove the swingarm pivot axle. 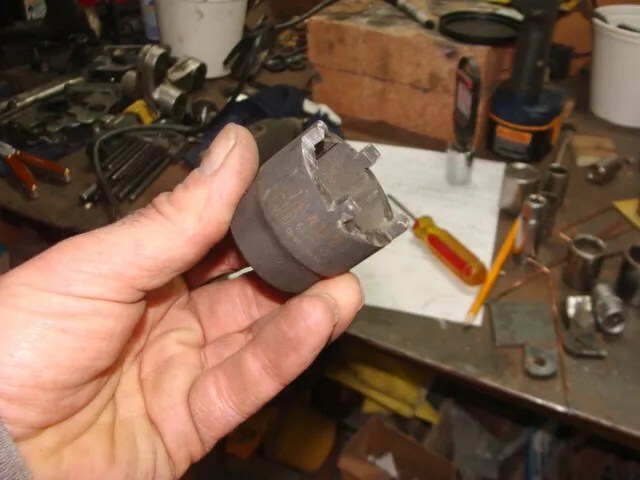 The cost of one of those tools is between $50 – $90, (a socket to remove the pivot axle locking nut). The other tool is a 19mm, (3/4″), hex head, (Allen wrench), socket. The hex head wrench costs around $18 – $20 at a local Napa store. 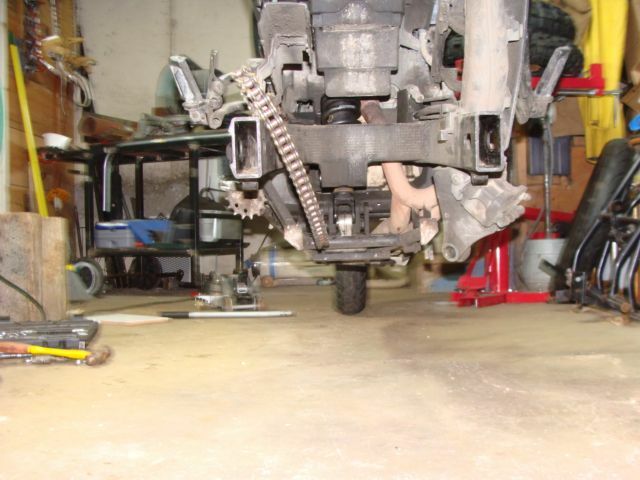 The left side of the swingarm pivot axle is a 15/16″ nut which is fairly straightforward. 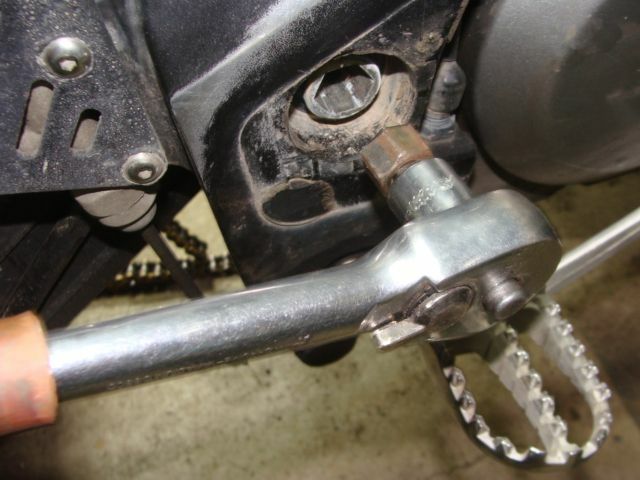 On the right side of the bike, the pivot axle locking nut and the pivot axle itself, have to be removed. This is what the “working relationship” between the two look like. 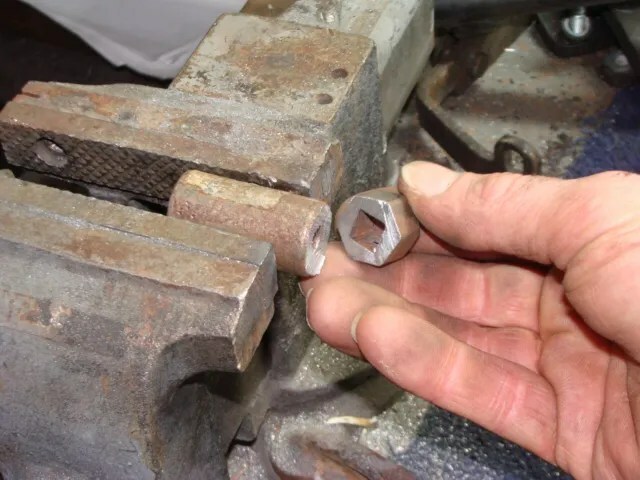 The locking nut is threaded on to the pivot axle. 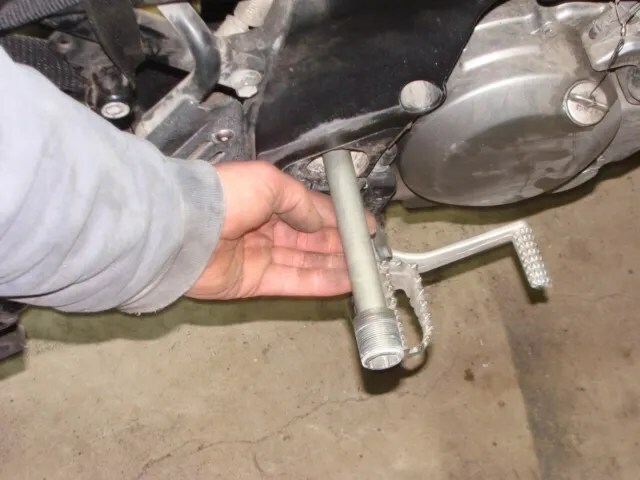 The pivot axle is threaded into the frame of the motorcycle. 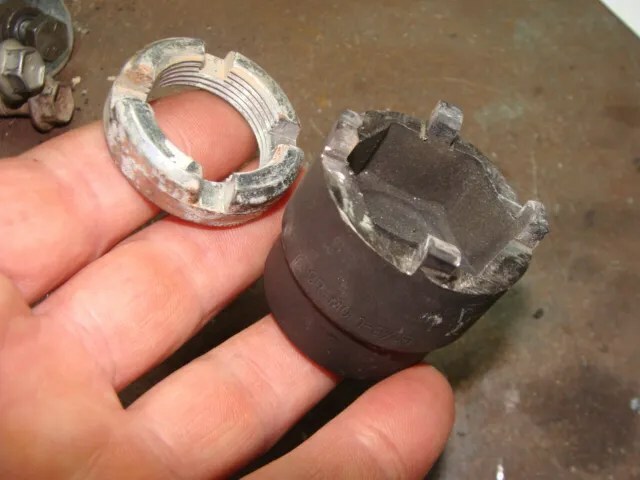 (What looks like “goo” or grease around the nut is actually dried silicone. I use silicone to keep the left and right rubber, pivot axle covers in place.). 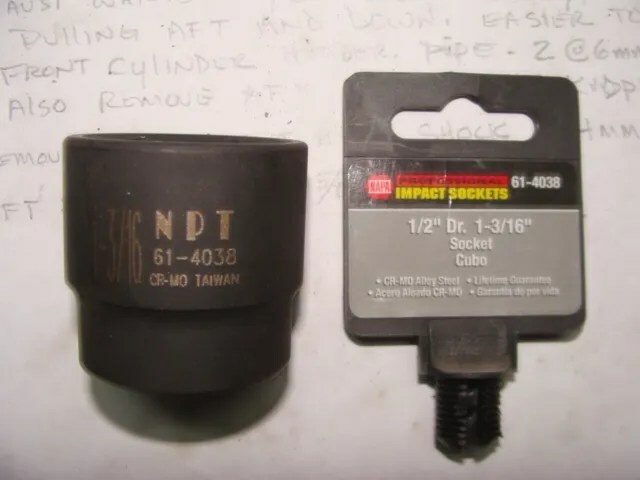 I purchased a 1/2″ drive, 1 3/16″ impact socket from Napa. It cost me, $8.78. 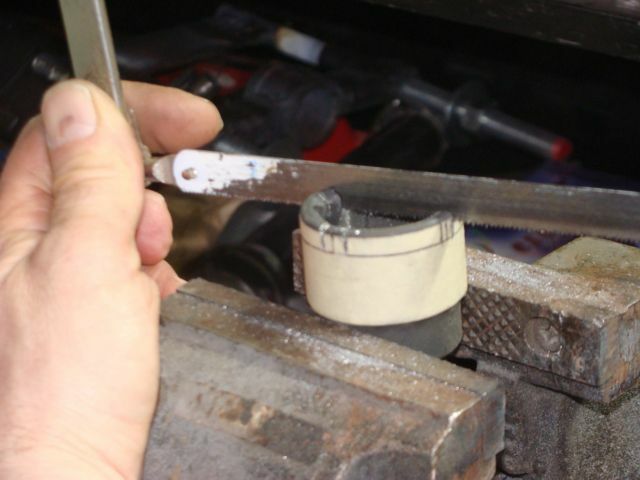 I wrapped masking tape around the rim of the socket so that it would be easier to mark where I needed to make the modifications to it so that I could remove the pivot locking nut. I checked the fit…..
…..and, made my marks. The depth of the “teeth” only need to be about, 3/16″ – 1/4″ deep. I cut verticle “kerfs”, following my lines, with a hacksaw. I used a Dremel tool to cut out the spaces between the “teeth”. Dremel has a fiber reinforced wheel that works perfectly for this type of a job. 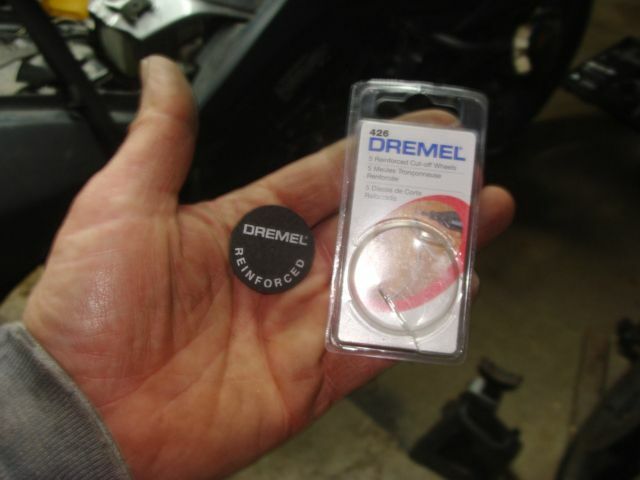 The wheels come in 5 units per package, (Dremel #426). I burned through two wheels to complete the cuts I needed to make. I checked the fit of the socket again and “tuned” the teeth with a mill file. Here is a photo of the finished homemade pivot axle locking nut removal tool. I snapped the socket on to my 1/2″ drive ratchet, slid my trusty copper pipe “cheater bar” over the ratchet’s handle and gave it a tug. 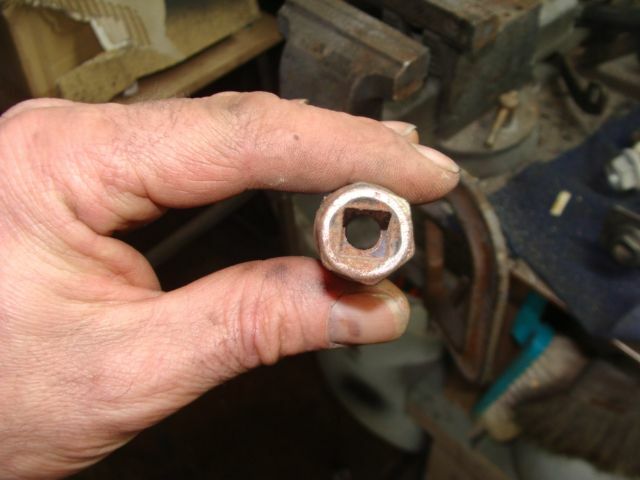 The locking nut broke free and spun off, (there is thread-locker on the threads). 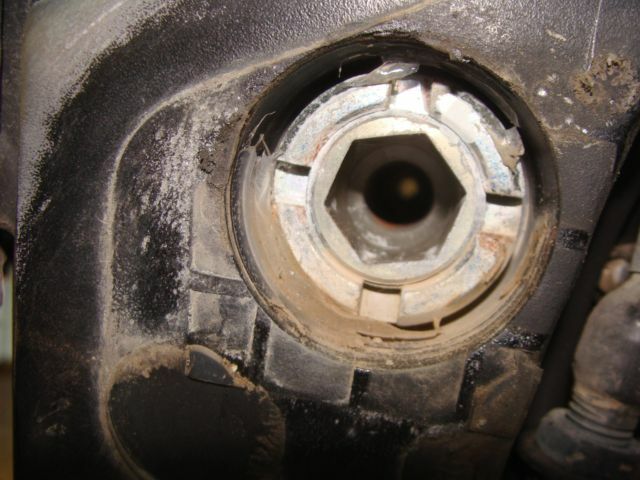 Here is a photo of the locking nut and the socket I modified. 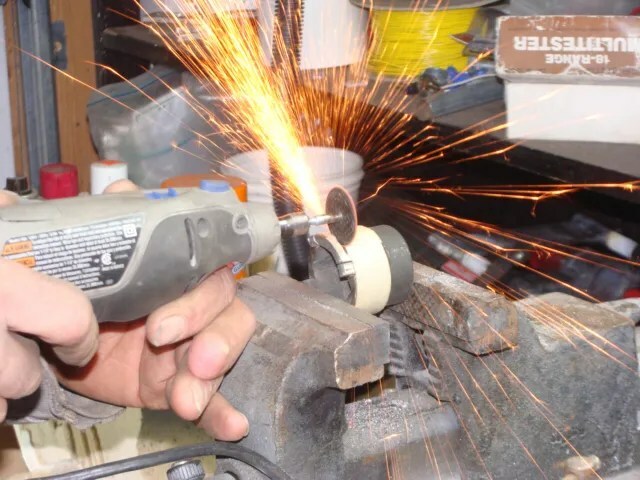 Next I needed to make a tool to remove the actual pivot axle. I have several old sparkplug sockets lying around. Often you will find that, smaller sized sparkplug sockets have a “hex head” and by coincidence, they fit perfectly. 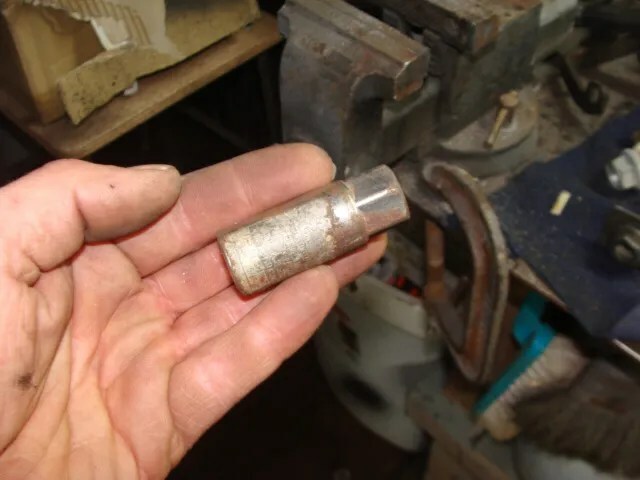 The one in the photo below is from the very first socket kit I purchased to work on my 1969 VW bus I bought back in 1979 as my first car. 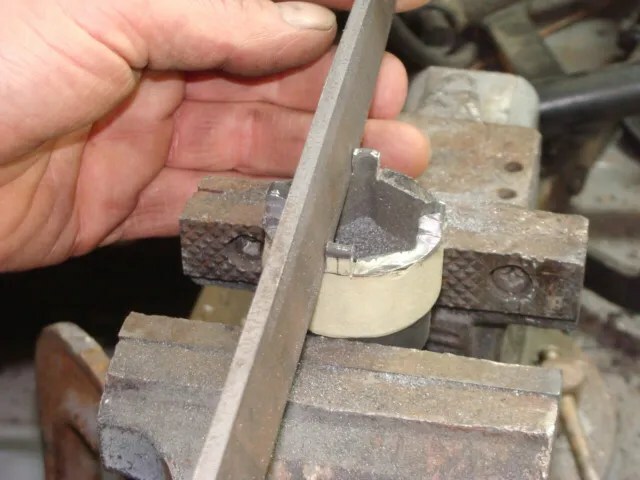 I have heard that, others that have chosen to go this route say that, they could slide a ratchet extension through the sparkplug end of the socket, and have it lock into the drive portion, (doing exactly the opposite of how you would normally use the sparkplug socket and extension). Out of the half dozen sparkplug sockets I had on hand, only one would allow me to do this. There is a “metal barrier” between the drive side of the socket and the working end of the socket. An extension can’t pass through the body of the socket and reach the drive end portion. 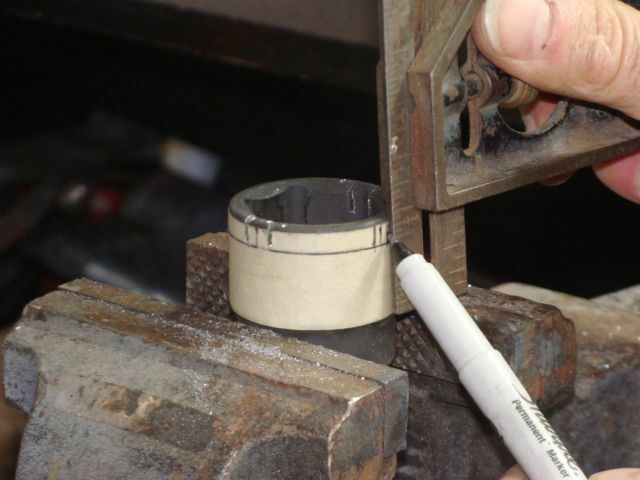 The extension is blocked by the excess metal. You can see the “barrier” down inside the drive end of the sparkplug socket. Using a hacksaw, I cut the drive end of the sparkplug socket off just above the metal barrier. I knocked off left over burrs with a mill file and snapped my new 19mm hex head wrench on to my ratchet. (I used a 1/2″ drive to 3/8″ drive adaptor). 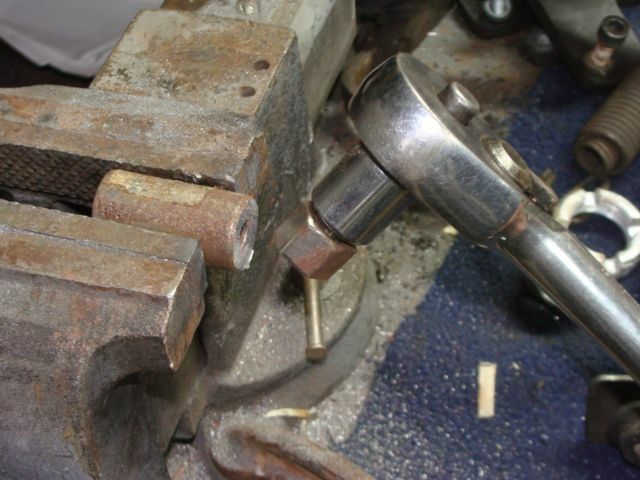 I slid my copper pipe cheater bar over the end of the ratchet handle…..
…..and gave the wrench a tug. The pivot axle broke free, (there is thread-locker on the threads). I pulled out the pivot axle and removed the swingarm. You will notice that there is not a centerstand, or a jack holding my motorcycle up in the air. 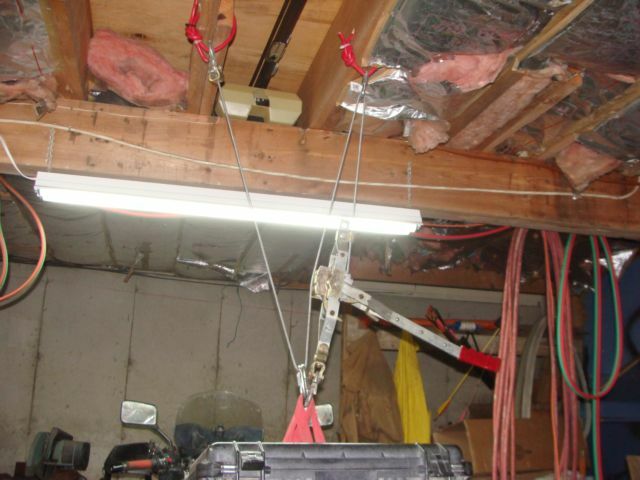 That is because I chose to hang my bike from my garage ceiling rafters. 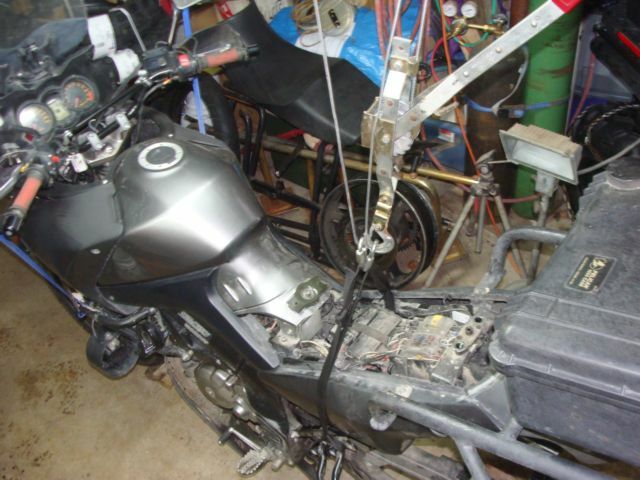 You see, the exhaust system also needs to be removed to get the swingarm off of the bike. That also means my skidplate, and mounting hardware had to be removed too. 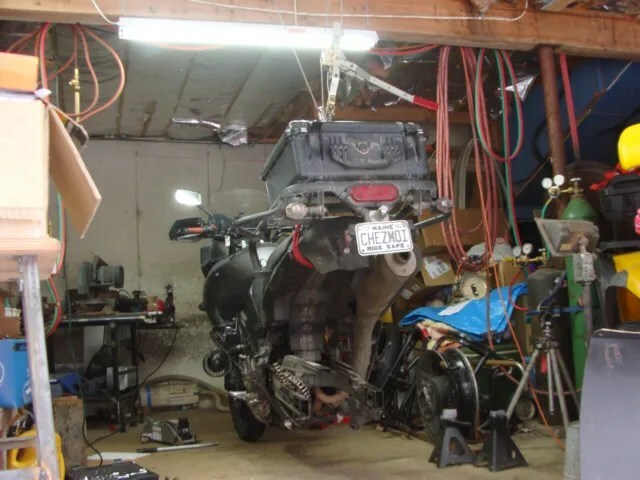 Therefore, there was no way to support my motorcycle from underneath. I drilled two holes through the ceiling joists and made some loops out of large battery cable wire I had squirreled away in a box. I added some thread-locking “D-rings”, some rock climbing webbing and a come-a-long to lift the back end of the bike up in the air. I didn’t like how the bike swayed back and forth, pivoting off of the front wheel, so I added, left and right “stabilizing straps” to the crashbars; utilizing standard ratchet straps. Since starting this project on New Year’s Day, I moved the original “pick up” point from the rear of the bike to the passenger footpeg brackets. The original setup put too much strain on the rear of the bike. I couldn’t unlock and remove the seat. The passenger footpeg brackets work better. Nice, unencumbered way to work! Great write-up. Well done. That looks like a ‘Plexi case’ you are using for a top-box. May I ask, how did you fix this to the rear of your bike and is it removable? It is a Pelican 1550 case that is bolted to a custom luggage rack that I fabricated for my DL-650. The steel for the luggage rack came from discarded cafeteria tables that I lugged home from my local high school. I guess I should post how I built that, huh? If you take a moment to access the link to: “Black Lab Adventures – 2012 Charity Fundraiser”, you will see better photographs of what my DL-650 looks like. Or, looked like! Someone else is riding that motorcycle now! I bought and modified a 1993 KLR 650…… Hopefully, those stories will come forth this coming winter. I shot over 11,000 photographs documenting that project! 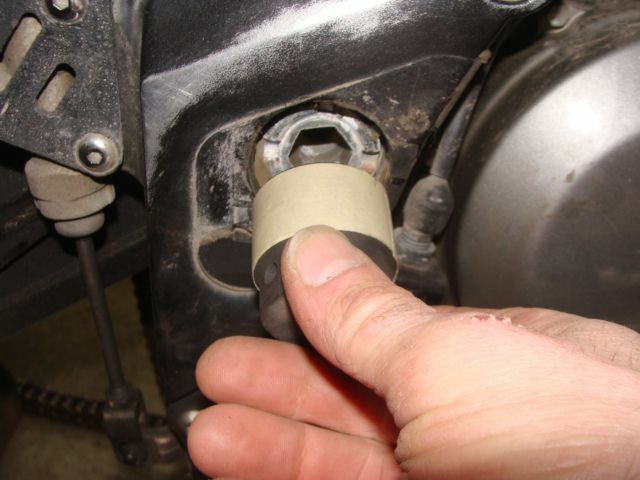 can I use this tool for Honda shadow vt500c because I had the same problem with removing it …. Hello Goran, I have no idea. I have never ridden, or done repairs to a Honda Shadow. However, it is possible that you could do a similar type of thing that I did for my V-Strom, to do the work on the Shadow.